A simplified way of finding out what trends are waiting for you in 2019, first check your element and feng shui star (gua number) below. If your birthday, falls between 1 January and 5 February and you want to know exactly what element was present when you were born, check the Chinese zodiac first. The 5th of February is a generalised date for the beginning of the Chinese New Year. Next, identify the house your feng shui star will be occupying your feng shui chart for 2019. For example, if your star is 2 (earth element), in 2019 it occupies the house of knowledge, skills, wisdom, education – so it’s a good year to study and learn new skills. It is also a good year for meditation and spiritual development. The I-Ching trigram for this house is mountain and perhaps visiting mountains this year might be beneficial for you. Check the I-Ching trigrams for the houses your star is occupying in 2019 for further inspiration and insights. Another example, if your feng shui star is 3 (wood element) – in 2019, it is in the house of success, reputation, fame and spiritual development – which is quite straightforward to interpret. The I-Ching trigram is fire so the actual element and symbolic representation can shed more light (pan not intended) on what you need to focus in 2019. Fire brings clarity and focus and this year you need to develop your capacity for clarity and focus. The fire also can go out of control, so your innate ability to manage your emotions might be challenged this year and be careful of any legal matters and read the small print twice before signing any documents. And one more example: if your star is 4 (wood element), in 2019 it occupies the house of life path, vocation, career and work as well as opportunities. This in the magic square is the first house for the nine years so it’s essential to plan your next nine years. What do you want to achieve in the next nine years? Plant some seeds for new projects, new careers, new opportunities, etc. 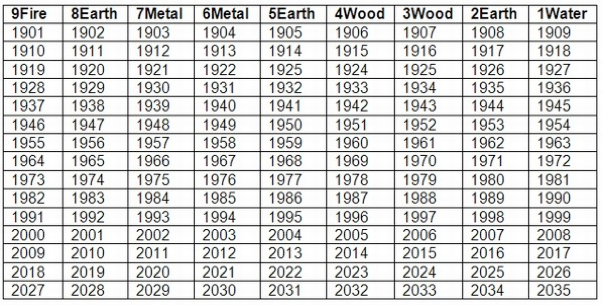 It’s the year of earth pig, so the element of earth is dominant in 2019. Anything related to this earth element might be significant or important in 2019 – symbolically and factually. This type of earth element is a big muddy which is a metaphor for this year too. As you’ve probably observed, in every aspect of life, from personal to professional to social to political to global – there is a certain confusion, division and lack of clarity. It all seems a bit ‘muddy’ at the moment (see Brexit in the UK). So CLARITY is an important mindset to be cultivated in 2019. What brings clarity? Peace and switching off from daily life as well as not taking things personally. You can feel it personally but don’t take it personally – stay detached and witness the spectacle of life. Probably the most important thing you can do this year is to find time to switch off, go off-grid media-wise and electro-smog-wise, meditate, spend time in nature on your own and recharge yourself on all levels, environmental, physical, emotional, mental and spiritual. If you allow yourself for at least 20-min of recuperating time during the day, you’ll build your clarity and resilience. Good, healthy sleep – especially deep sleep – is another chance to recuperate and rejuvenate, so make sure that your bedroom has good feng shui (start with switching off wifi for the night, etc.). From time to time pause technology and choose consciously where your energy needs to go. Choose to live consciously and on purpose each and every day of the year. The colour of the earth element is yellow or brown. But according to Pantone colour trensetters– the colour for 2019 is coral. Read more about coral – the colour for 2019. Do something new. To celebrate the New Chinese Year which last five days – wear something brand new. Get a new purse if prosperity and wealth creation is important for you. Go for Chinese food – I suggest Yauatcha in London which I feng shui-ed (plug:). Start something new – anything – a new project – set up a file on your computer – your intention will count – you have five days – or actually, anytime is good. Write down your personal and professional values for 2019 – what you want this year – health, happiness, wealth, love, success, opportunities. Your values connect you to the right forces and energies that channel grace to your life. For example, if love and harmonious relationships are important for you in 2019, read my blog with top feng shui tips for love and harmonious relationships and Valentine’s Day. Traditionally, get nine oranges and place them somewhere visible in your home for five days. Make your bagua collage, vision board for 2019 – and place it next to your bed or somewhere visible – to prime yourself and your non-conscious mind to notice and grasp opportunities you want in your life. 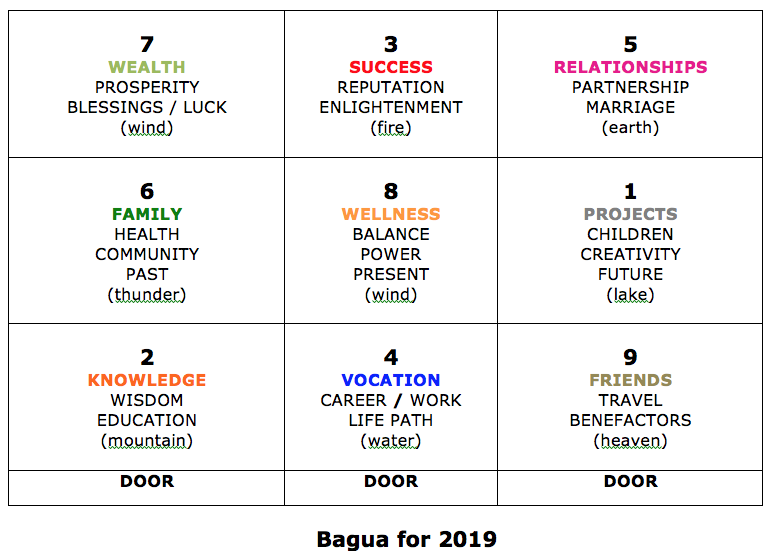 Write down your goals for 2019 in each section of bagua and/or get some images to represent what you want. Remember, feng shui is a way of ritualising your prayers or intentions. Feng shui = intention + energy/power + ritual. If you’re into classical feng shui – hang a metal windchime in the south-west part of your home or workplace. Apparently, the negative energy is coming from that direction in 2019. 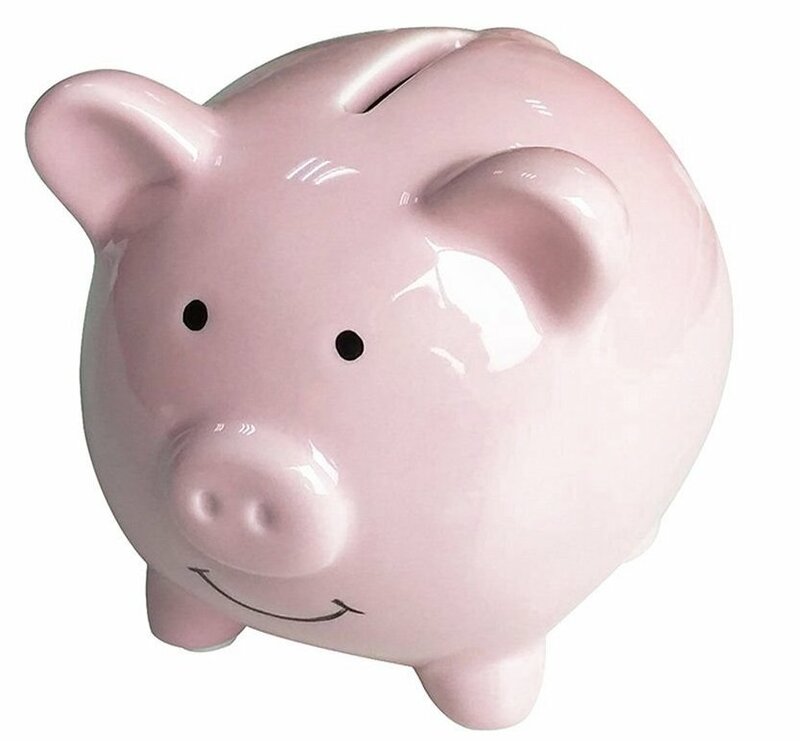 Get a piggy bank – ideally made of ceramic (earth element) and start adding some coins and banknotes. Place your piggy bank near the door or in the wealth corner of your home or office. Change your doormat. A star doormat would connect you to a larger life and help with your spiritual development. For your spiritual development – get a Himalayan salt lamp (earth element) and keep it switched on. Pigs are believed to be emotional (love-oriented) and intuitive as well as calm. They also are artistic, creative, refined and well-mannered. They are compassionate, empathetic and caring yet can be detached. They seek beauty and sensitive love. They tend to be unique, self-sacrificing, obliging, sensible, tactful and prudent. On the negative side, they can be naive, pedantic, insecure, cunning, indecisive and sometimes pessimistic. The sign of pig is most compatible with the Rabbit as well as with the gentle and sensitive Goat. The Snake is believed to be incompatible with the Pig. (Note that astrology is not evidence-based discipline and it shouldn’t be taken literally or seriously. Otherwise, you are going to give yourself false problems and worry unnecessarily about things that are not true. Learn how to decode feng shui). From an archetypical perspective, Chinese animal zodiac signs are another way to connect to the animal kingdom and archetypical energies of animals and can be perceived as a type of spiritual practice. 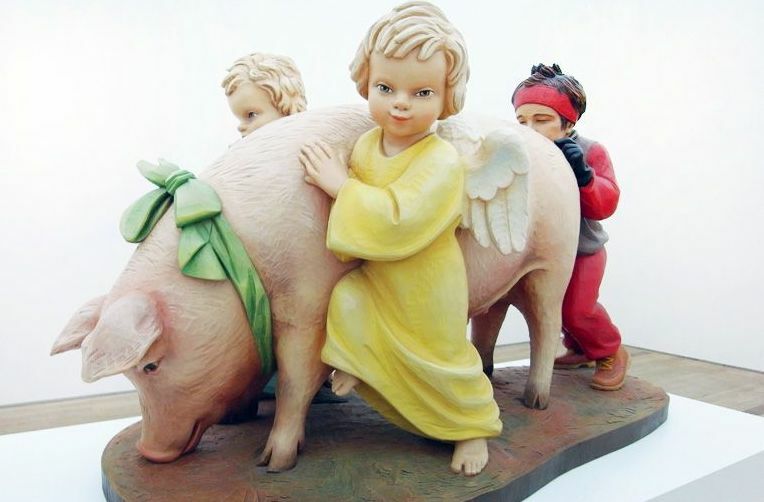 The pig energy is associated with the 10th month, when winter begins, in the Gregorian calendar from 7 November to 6 December. The pig hour is between 21:00 and 22:59. 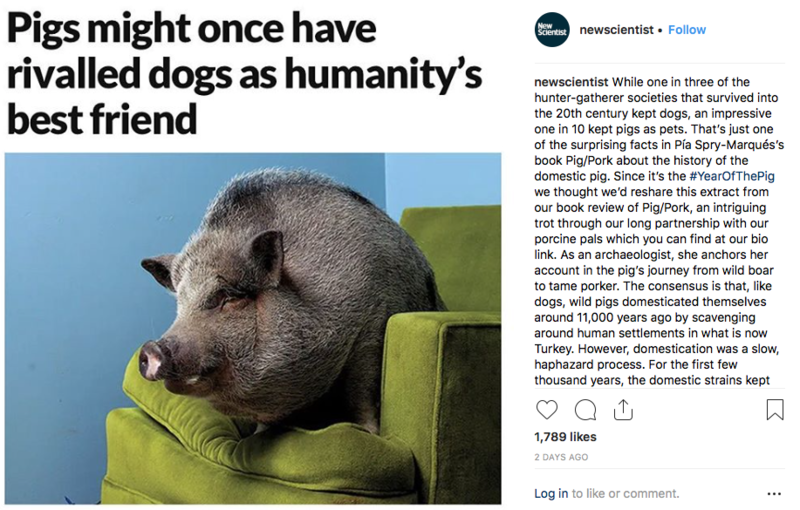 Posted in 2019 The Year of the Pig.